Difficulty: YDS class 3 (using fixed aids), otherwise class 4. A good base camp is the tourist/resort town of Stary Smokovec. This tourist village is located along Hwy. 537, a road that runs along the south slopes of the Tatra mountain range. We drove to Stary Smokovec from the Polish city of Krakow. One can also reach this location from Bratislava (350 km, about 4 hours). 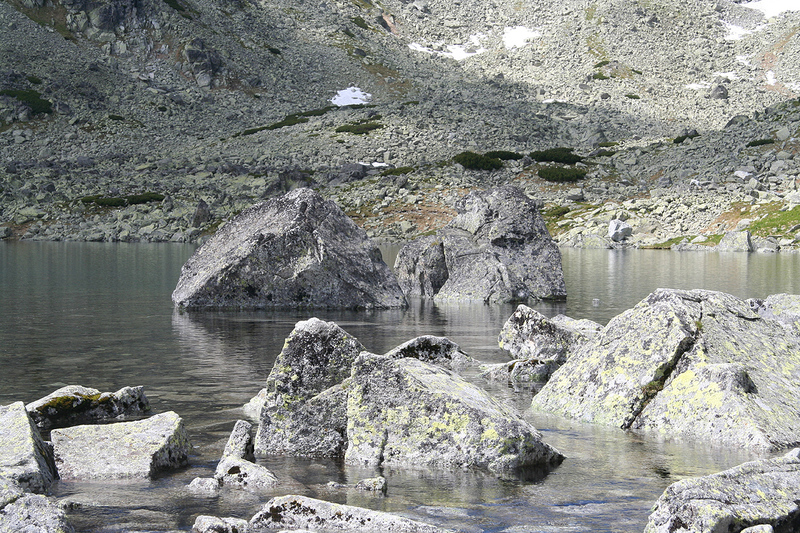 See information about Strbske Pleso, a more well known tourist location that is located just 15 km west of Stary Smokovec. There are lots of hotels spanning many different price ranges. 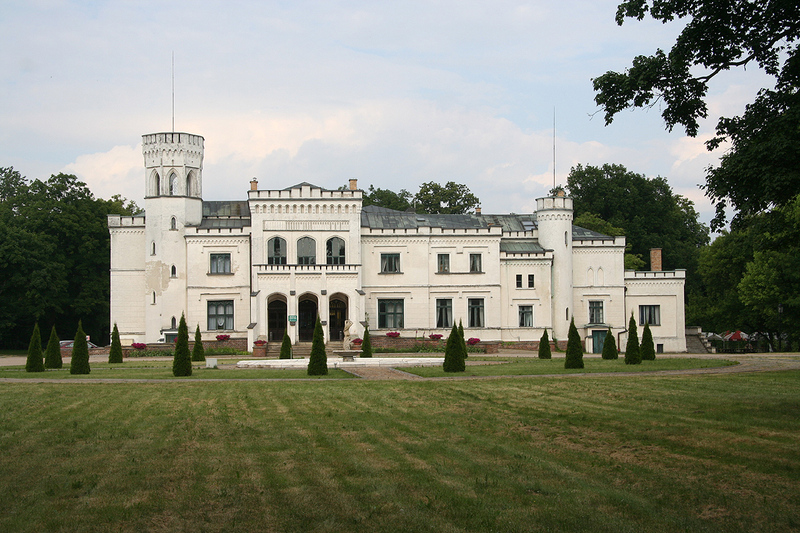 We stayed in Villa Kunerad, a very nice, but basic location at Euro 15 per night (2010). The road to Sliezsky Dom turns right off Hwy. 537 about 3.5 kilometer west of Stary Smokovec. This road is restricted, you travel with a landrover (taxi) that will charge Euro 25 for the trip or Euro 5 per persons if the party exceeds 4 (2010). One can drive a private car up provided that one shall stay overnight at the hut, this was not an option for us since the hut was closed all of 2010 due to extensive maintenance and upgrade work. There is a small parking area that holds 5-6 cars, on the left hand side of the road just opposite of the road fork. 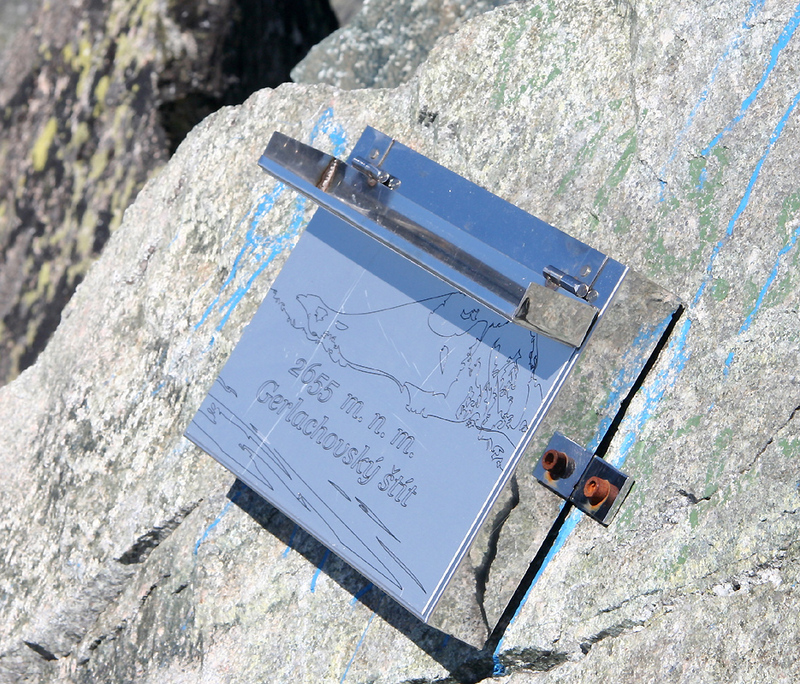 This description covers a traverse of the mountain, the route that Slovak (UIAGM) guides will use. Both the ascent route and the descent route has been "facilitated" in a few places with iron steps and perhaps a section with an iron chain. There is plenty of scrambling and care is definitely needed. Early in the season (end of June), there may be snow left in several gullies that need to be crossed. This increases the difficulty somewhat and definitely adds time when compared to a "normal" ascent. The normal route of ascent starts out from the mountain hut Sliezsky Dom, located at N49:09.368, E020:09.408, elevation about 1680 meter. Cross the small bridge and proceed in the valley on the right hand side of the small lake. Ascend more steeply and cross the creek a bit above the waterfall. Just a bit higher, fork left from the main trail and climb higher on a good climbers trail aiming for a pretty distinct gully that comes down more steeply from higher up. The steepest part of the entire climb to the summit starts right here. This location is N49:09.714, E020:08.824, elevation about 2000 meter. Cross the gully (small creek) and climb up as you move right, following a pretty obvious route. There are a couple of bolts as well as a few iron steps here. Higher up, there is a final step as you turn left, again aided by an iron step. The terrain is fairly exposed. Once you are up here, the route continues along a climbers trail. You will have the gully on your left and the route follows a pretty distinct rib that continues up towards a col that can be seen (much) higher up at the horizon. This section is easy, mostly a (YDS) class 2 trail, a few easy scrambles (YDS 2+) here and there. Higher up, the route tends a bit right before traversing back left to top out in the local col at location N49:09.645, E020:08.412, elevation 2429 meter. From this point you can see the summit for the first time. In order to get there, one needs to do a pretty extensive traverse. 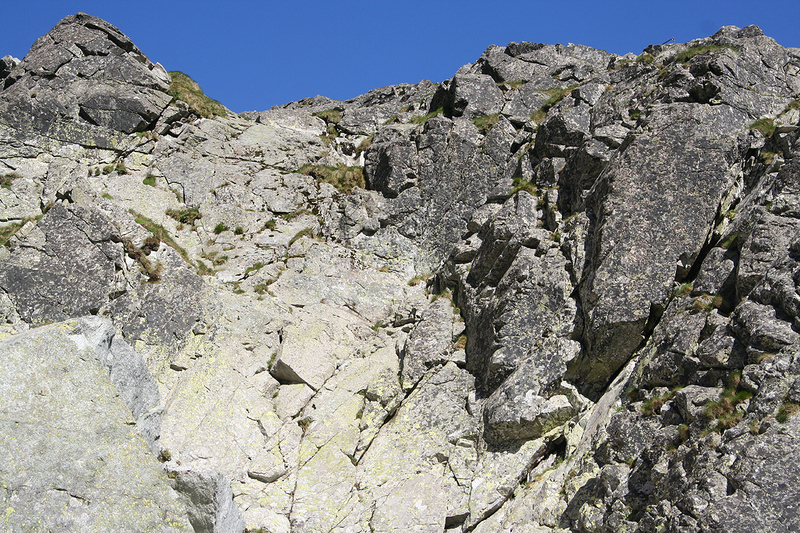 This traverse includes a few descending sections as the route is crossing several gullies that run downslope (from right to left as viewed by the climber). The route is not well marked and it may require some trial and error if attempted without a local guide. The gullies may be filled by snow early in the season, one then needs to take extra precaution if the snow is hard or icy. After crossing three gullies, one can ascend right, then scramble left and upwards to the proper summit. The second route, which is normally used when descending, is easier to follow. It can also be used as a climbing (ascending) route. A description that runs uphill is as follows. From the hut Sliezsky Dom, take the trail that starts above the hut and runs left, ie. 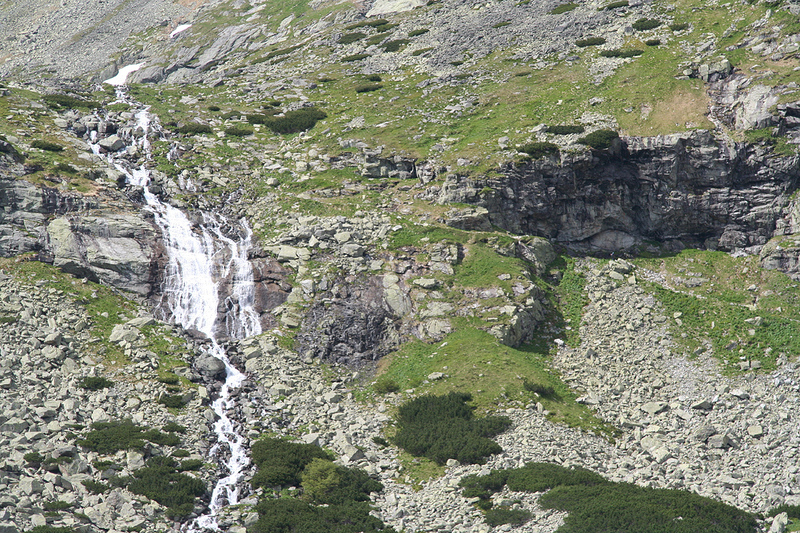 the trail starts a contouring path that heads south, then west in order to traverse west to the small lake Batizovske Pleso (elevation about 1880 meter). Take a climbers trail that forks right of this lake and then heads into the basin just north of this lake. Continue uphill (along a trail) to location N49:09.576, E020:07.818, elevation about 2160 meter. From here, leave the main trail and head more right uphill on the right side of a small creek. Continue uphill to location N49:09.662, E020:07.977, elevation about 2350 meter. From here, there are two variants. One may continue straight up into a distinct, but steep gully. There is a chain here and the climbing is not too difficult. Alternatively, one can turn left and follow a snowfield (at least early in the season), ascend this snow and head right in order to gain a broad path/ledge that will connect with the previously described route. Either way, continue uphill, aiming for a very distinct, but steep gully further up. This section has been equipped with several iron bolts and a few iron steps near the steepest, upper part. You are now at the lower end of a gully that will lead upwards directly to the main summit. In early season, the lower part of this gully has snow, but the slope is quite reasonable. Higher up, one will easily see a branch that goes left directly to the summit. If one follows the main gully higher, one can also easily traverse left higher up and reach the summit. 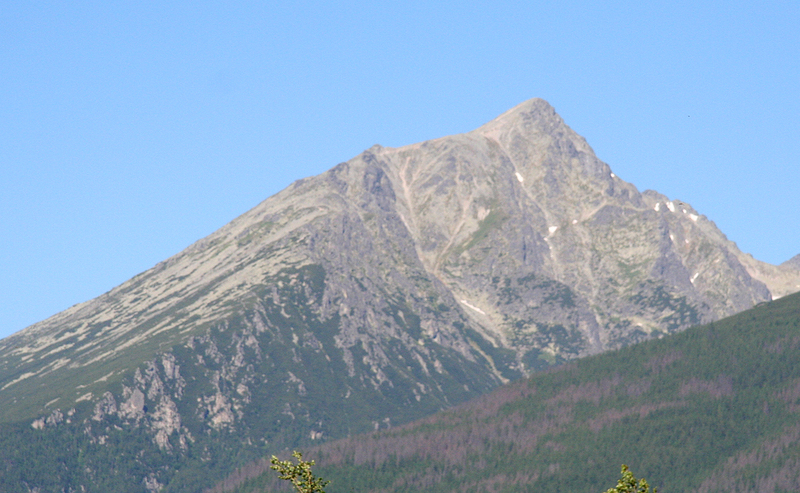 This mountain has the somewhat special distinction of having been the highest mountain in 4 different countries, Hungary, Polen, Czechoslovakia, and currently in Slovakia. 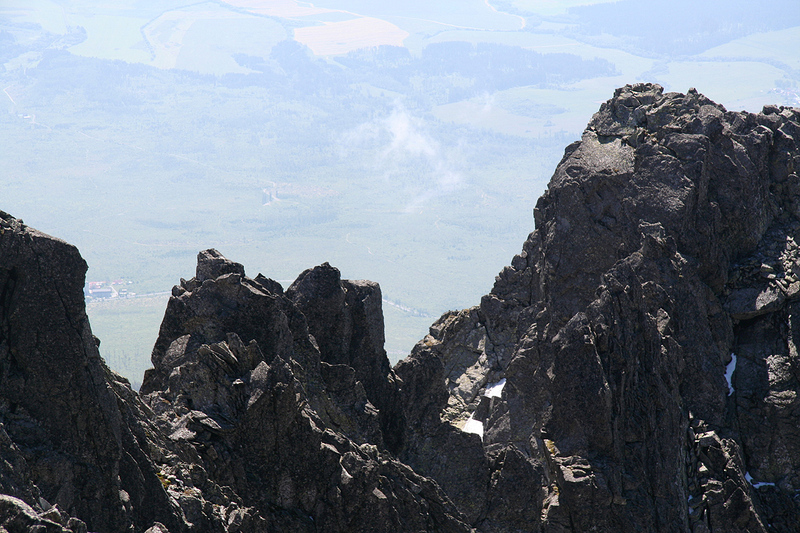 Slovakia has made it illegal to hike in the Tatras outside of "official trails". This is a quite severe restriction. They allow exceptions for people that can show an UIAA membership card (This applies to very few Norwegians!) The result is that they effectively have established a UIAGM guide monopoly for conducting tours and climbs in the area. This is a frightening example of a development that we must avoid in the rest of Europe! 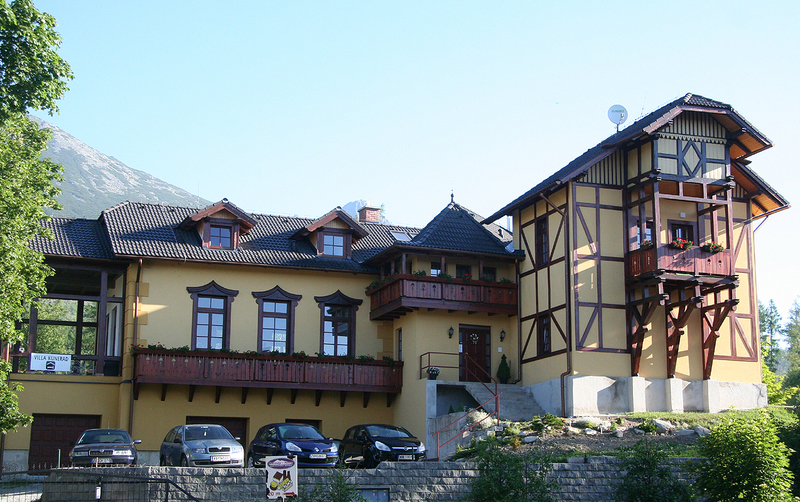 We arrived at the Villa Kunerad hotel around 2000 and were warmly welcomed by the owner. After dinner at a nearby restaurant (recommended by our host), we went to bed around 2200. Up at 0530 and ready to go by 0545. We were picked up by Kuro Liptak, 37 years old and an aspirant UIAGM guide. 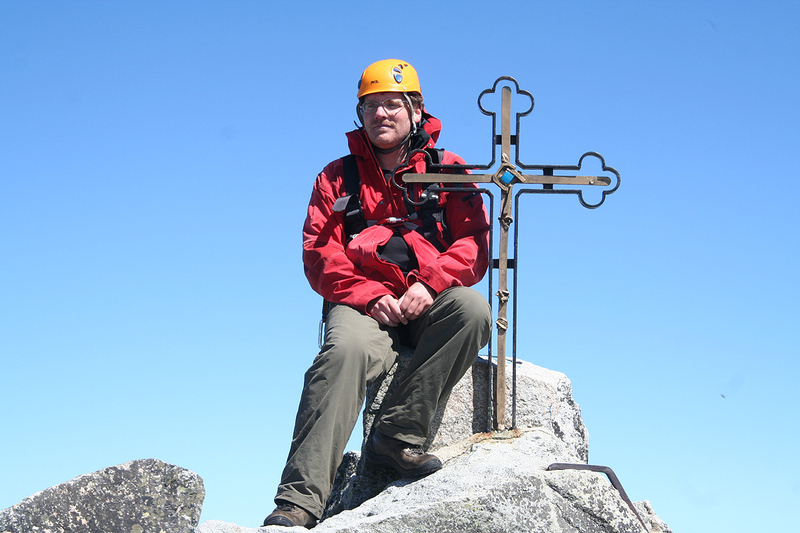 He would do the actual guiding, while our "real guide", Jano Kostka, would follow leisurely behind and observe that everything was done according to the rules. Obviously, this created a quite special situation where Kuro had to show (in every detail) that he could act as a "babysitter" on a route that Åke and I normally would have climbed without using a rope. Kuro did a good job, I have no complains about specific guides, the UIAGM guides are professionals with a very high standard. 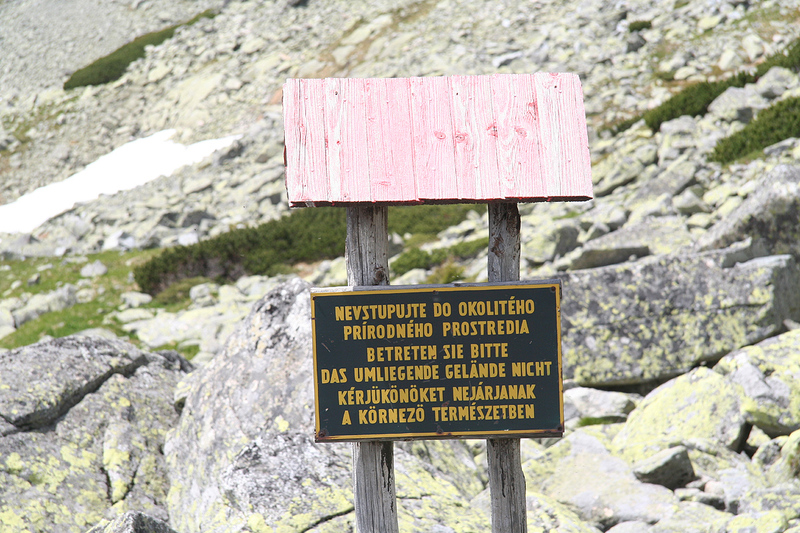 My critisism is directed at the system that the Slovakians have established where people are restricted to trails unless they pay for guide service. We drove up to Sliezsky Dom with 3 men in the front seat and 10 more in the back. Including backpacks this car was definitely filled to capacity. Starting out from Sliezsky at 0630, we hiked up to about 2000 meter at 0715, where the climbing begins. The first pitch is following some cracks up to the right, then turning left in a somewhat exposed position, easier ground is just above. This is the steepest section of the entire route to the summit. We continued uphill to the horizon col, then traversed the broken face in order to gain the final summit via a fairly easy final scramble. There was hard snow in a couple of gullies, this caused us to spend some extra time. We gained the summit at 1030, with nice weather and just a slight wind. 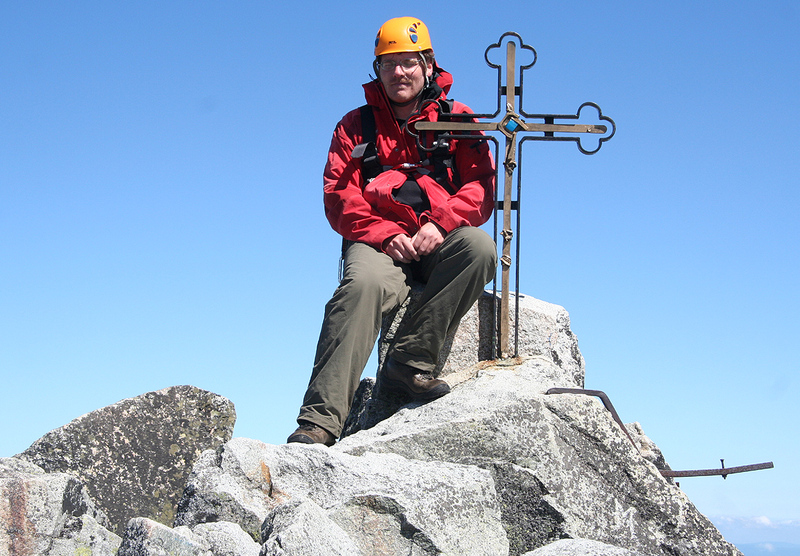 The summit has a nice box containing a register, as well as a metal cross on the highest rock. We spent a full hour at the summit, enjoying the view and eating lunch. There were two other teams on the summit as well. The guides claimed that this was the first really good day to climb Gerlach this season. The last time they had been here was back in September 2009. Leaving around 1130, we headed straight down the gully that merged with the snow gully further down. The snow was good and descending without crampons worked well. Kuro started out using a top belay, then walking down to us in order to repeat the process. The assumption is then that we might fall, while he would not. Further down, we started walking and I suggested that we might as well unrope. Kuro was unhappy about this and indicated that this could only be an option if I carried special insurance. Thus, liability popped up as an issue, just another problem with guiding that almost unavoidably comes to the surface when a person with certified training is paid to take some other person (with unknown skill level) along on a steep mountain. Eventually, we did unrope as traveling with a rope was less practical. 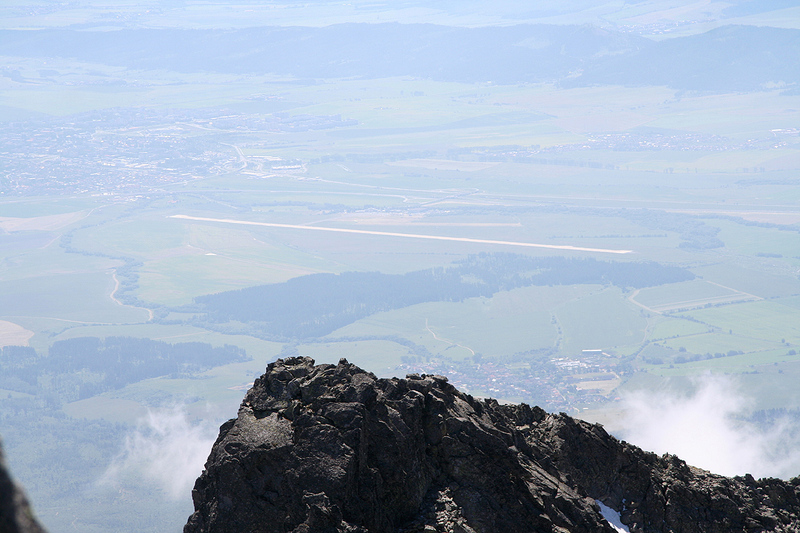 We reached the base of the climbing section by 1230, 300 vertical meter below the summit. 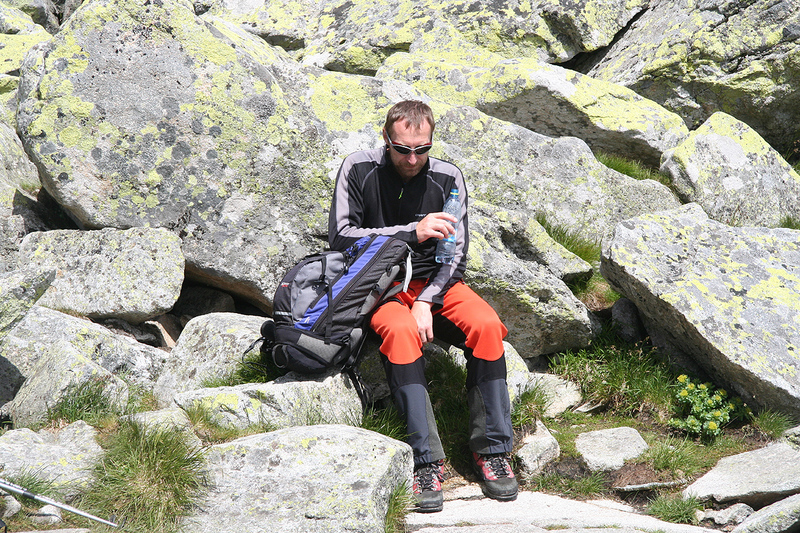 We took several rests as we hiked down the Batizovska valley to the Batizovske pleso (lake). 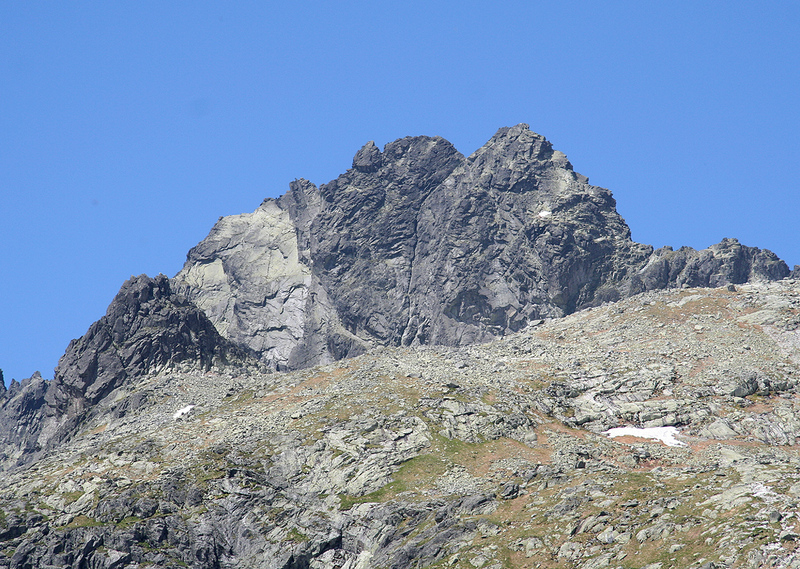 Viewed from the lake, the Batizovsky Stit, 2448 meter, at the end of the valley looks quite imposing. From there, a bigger trail (with many hikers) contours around and back to our point of departure. Back at Sliezsky Dom around 1500, quite a few people on the terasse and a premium Czech beer seemed well deserved. 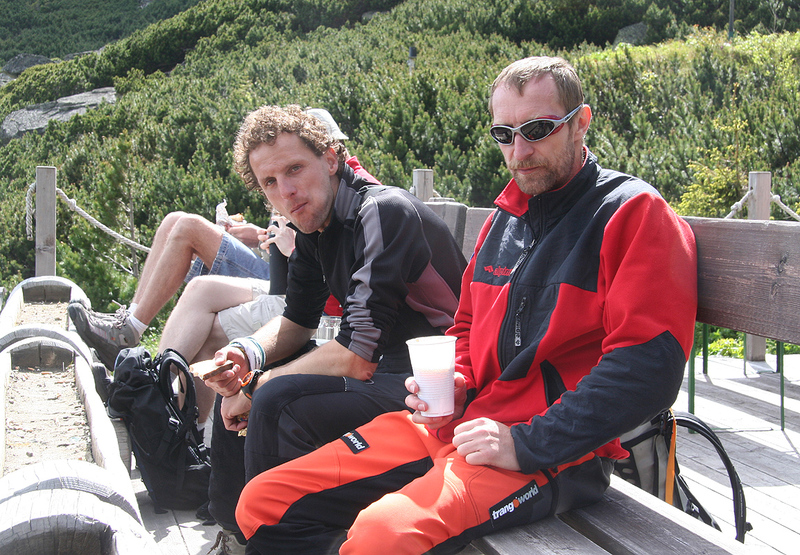 It was time to pay and say goodbye to our two guides, Jano Kostka and Kuro Liptak. 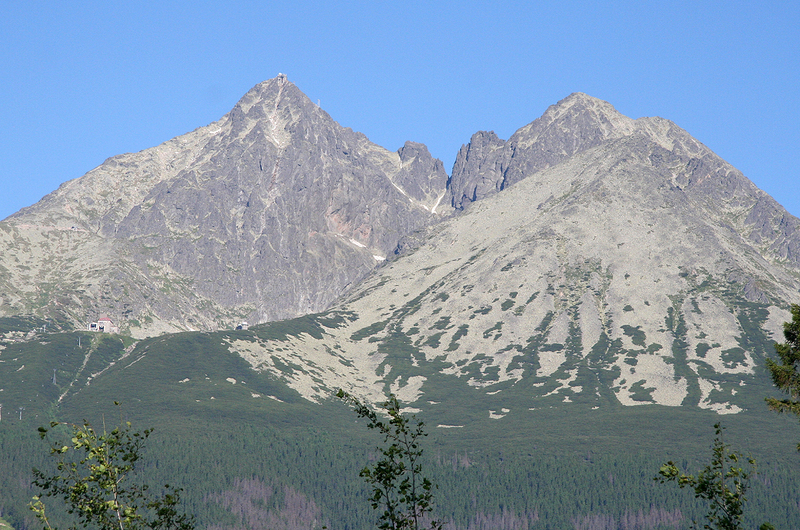 The High Tatra, as seen from Poland. 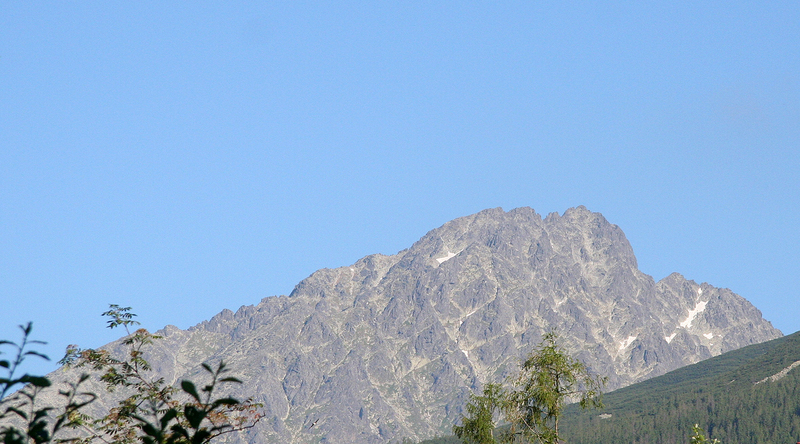 Slavkovsky Stit, 2452m, as seen from Hwy. 537 on June 29, 2010. 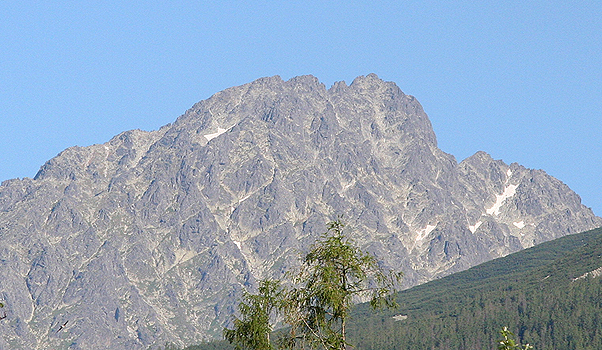 Lomnicky Stit, 2634m, as seen from Hwy. 537 on June 29, 2010. There is a cable car serving the summit. 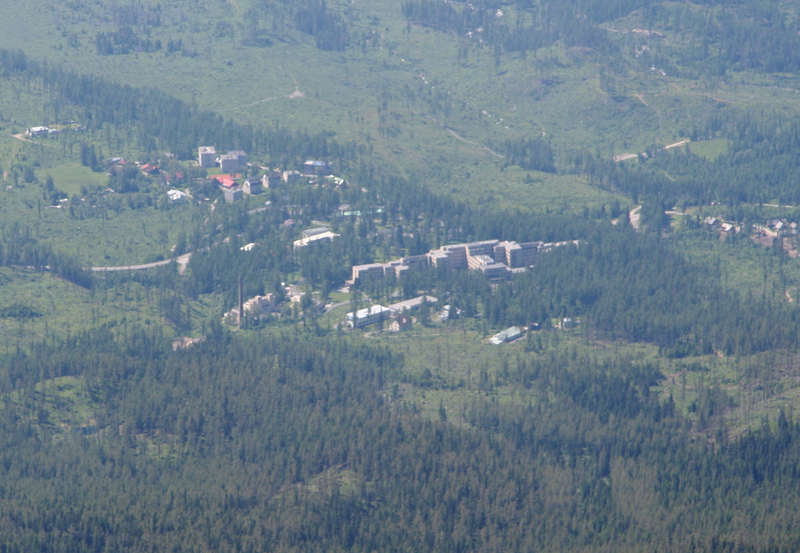 Gerlachovsky Stit, as seen from Villa Kunerad. Summit Panorama I, from the east side and clockwise to the top ridge. Summit Panorama II, continued from previous. Summit Panorama III, ending at the east side.